There are many good, bad, new, old, free, paid, freemium etc feed readers. How We Ranked Among Top 25 IT Blogs in One RSS Reader is Probably Important to Know Particular if is a Webmaster Who Needs to Promote Own Website. The website aka Feed Reader ranked us is Feedspot. We really have no black hat SEO or marketing strategies starting from Wikipedia linking, DMOZ listing or this listing by Feedspot. The reason to publish this article is to give an idea of potential usage of RSS feed. Most importantly, they emailed us to submit site, otherwise we would never know that they have provision to submit to get listed. You will get the list of 25 IT websites of 2018 here. As you can see, most websites actually has ever-green contents. But there are more good websites on this earth who still has no idea of existence of the web form to submit to attract them to consider in some list. Cloud Computing or Sysadmin niche not expected to have zillions of traffic on a blog site. Of course, there are methods to increase earning in short term with blog – How They Make Huge Money From Blog. There are hundreds of ways of making money, baiting innocent n00b humans to click affiliate links just because they lack idea is not a way of honest earning in sustainable business model. Good RSS subscribers is an important resource of a site. In other words – this article is NOT a guide for building links by spammy websites of any form. We do have good amount of resources on GitHub as repo and Gists. Maintain your website with high value evergreen content, well researched articles with good graphical presentation. Higher quality, niche websites will have lower number, high quality readers. The relationship is not having blind followers. Regular earning in various ways actually become higher than that of low quality content sites and peoples normally give nofollow or dofollow links. Links from Free Software repositories of own project are always dofollow. Give importance to human maintained various listing sites including RSS feed sites. There are websites, which will definitely list you. We actually make lists of websites on GitHub as sources. It is obvious that a website with good content will be in the list. None actually care how many zillions followers one website have. Everyone needs good resources. We informed you about one resource – feedspot.com with practical points. It is not highly important that how big or small feedspot.com is. It is first of all an exposure to the webmaster and secondly, listing by sorting in that way by human does demand huge work which deserves some respect. Of course there are more such websites, which we yet do not know! This Article Has Been Shared 6040 Times! These steps will help you to make money from a blog. You would not get just one payday, but several. This is what is called passive income. It is a matter of fact, most of the blogger who works hard to write blogs expects a monetary return. And why would not expect? Almost all Wordpress users use Google Analytics.We have discussed how to use in-page analytics to increase your pageviews of your blog. Planing For Earning Money Online For Beginner to AdSense Empires simply a logical article to guide you the stable ways to make money for years after years. 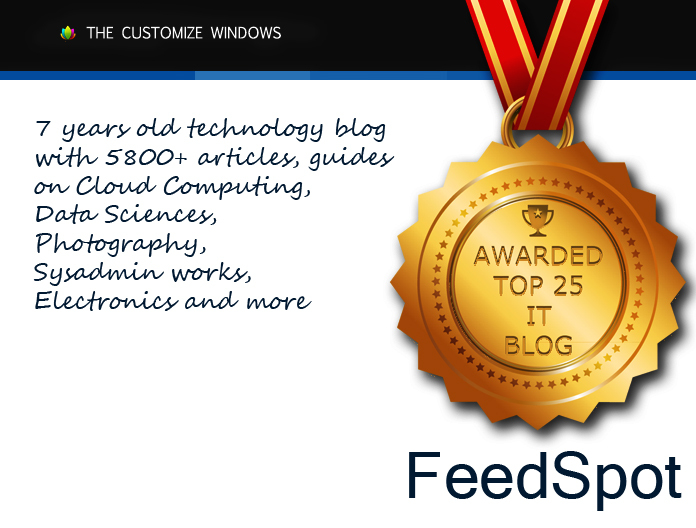 Cite this article as: Abhishek Ghosh, "How We Ranked Among Top 25 IT Blogs in One RSS Reader," in The Customize Windows, April 26, 2018, April 23, 2019, https://thecustomizewindows.com/2018/04/how-we-ranked-among-top-25-it-blogs-in-one-rss-reader/.